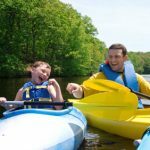 If you are an avid kayaker, you have probably already discovered that a number of different vessels and boaters are likely to share the rivers, seas, lakes, and waterways that you feel at home in. Additional vessels such as pleasure boaters, working vessels, canoes, power boats, sail boats, and ships of all shapes and sizes may be on a large body of water at any given time. Although kayakers enjoy the privilege of being able to escape to wild and wonderful wilderness settings for their paddling, it is not always possible to paddle in such conditions, and every now and then, you might have to paddle in more hectic waters. When you kayak in the same bodies of water as people with power and motor boats, you run into a situation that is very similar to what cyclists face when they venture out onto roads and streets filled with cars while riding their bicycles. Most frequent road cyclists are aware of the fact that when you ride a bicycle it is important to keep to the right part of the road where you will not run the risk of being caught in the main flow of traffic; this is because there is likely to be faster and more dangerous traffic in the middle of the road that you might want to avoid when riding, such as cars, trucks, and even semi trailers. 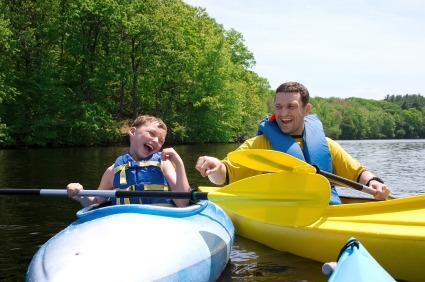 The same principles are relevant when kayaking. Larger boats are more likely to follow certain paths. Such paths might be marked channels that are potentially also dredged. They might also be reasonable travel lines connecting two places or even river beds and mouths of harbors. When you are kayaking in open waters, however, such as when you are close to an ocean or a sea, you should expect large vessels to be on virtually any course one could imagine, which means they might head in every possible direction. When examining navigation maps, pay attention to colors to help you paddle in traffic and judge collision courses while on a kayak. Deep open waters are typically identified as white while more shallow water is marked in blue and inter tidal zones are typically green. People in power boats will tend to avoid green and blue portions of such maps and also try to avoid hazards that are also marked on navigation charts. If power boaters navigate in areas marked in blue or green, particularly when hazards are close by, it is probable that they will do so at slower speeds. As a kayaker, you can conceptualize the blue, green, and hazard portions of a navigation chart to be the equivalents of seafaring sidewalks, or safe shoulders where you will not be in the way while in a kayak of vessels that are larger and capable of reaching much higher speeds. You might often find these waters to additionally be more fun and interesting to manage. However, you cannot paddle on the sidelines all the time when you are out in the water. After all, you are in a kayak because you want to go places. It is necessary to get out into the highly trafficked areas and paddle in traffic and avoid collisions at times. Just as if you were a pedestrian trying to cross a busy roadway, when you are in a kayak the best way to cross a boating channel is quickly and directly from one end to the other at a 90 degree angle. You do not want to idle around in traffic when you are crossing the danger zone. Before you cross you should stop to carefully examine traffic and judge potential courses of collision so you can time your passage well. If you are in a group, this is particularly important as it will give fellow kayakers in your group a chance to get close to each other in a bunch. Just as with pedestrians, there is safety in numbers; when you cross in a close pack you will have an easier time of seeing what is going on and you will not take up as much space during the passage, which will make you a smaller target for larger, faster, and powered vessels.